This past weekend, I had the opportunity to watch the 2009 documentary film Big River Man. Though the film was often shaky and the voice overs a little grainy, I had to go for a long walk to reflect on the movie after watching it. My emotional response to the footage was immediate and intense. In the opening scenes, the movie introduces us to the Slovenian long-distance swimmer, Martin Strel (Wikipedia article). The story is told by his son, Borut Strel, who recounts Martin’s childhood experiences with an abusive father. As a member of the audience, I sympathized more with Borut’s struggles than I did Martin’s issues; the son delays going to college and starting his own life so that he can document and promote his father’s swimming records. Martin holds successive Guinness World Records for swimming the Danube river, the Mississippi River, the Yangtze River, and the Amazon River (Wikipedia article). Photo credits to Borut Strel, 2011. On an emotional level, I felt a primal fear at the thought of being so intimately associated with creatures of the sea. I’m not a huge fishing or swimming fan. But Martin, whose first experience with endurance swimming purportedly began with swimming to survive his abusive father’s attacks, seems to relish getting up close and personal with the water. Consequently, the film Big River Man documents his 3,300 mile swim down the Amazon River between February and April 2007 (Wikipedia article). Now for anyone who has ever read a book or seen a movie on an elite athlete, the typical mental image is one of a well-muscled, healthy, vigorous youth. 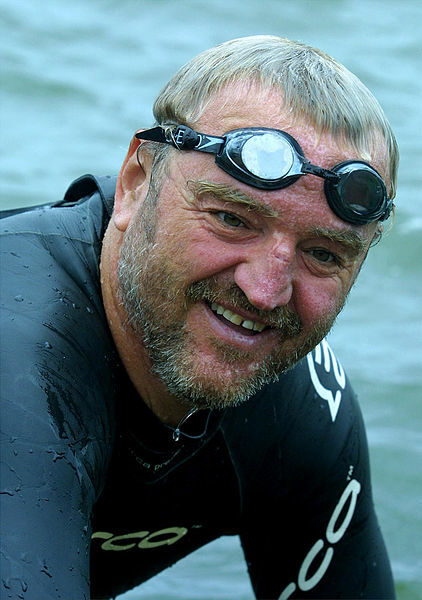 The incredible thing about Martin Strel is that he swam down the Amazon River in his 50’s, has a – shall we say heavy? – physique, and consumes vast amounts of wine during his swims (yes, that’s right – during the swims). This should immediately blow out of the water our preconceived ideas that a person has to be attractive (or healthy) to be successful in elite sports. Additionally, Martin was a professional gambler earlier in his career. This follows him later in life, and the movie Big River Man ends with the son suggesting that his father had gambled away all of their sponsorship money. During the Amazon swim, there are hints that Martin is going crazy. The movie therefore also questions our idea that a successful story has to have a happy ending and morally superior characters; clearly, ambiguity is rampant. Perhaps because of Martin’s uncharismatic physical exterior, the world quickly forgets about him after his crowning success in the Amazon. We are left with a curious sense of detachment towards the end of the film, wondering if life has improved or merely stayed the same. This, too, hints at the elusive nature of success and how it can lead us down unexpected – and perhaps unwanted – pathways.